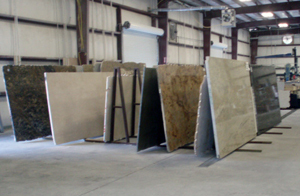 At Granite Quarry Direct, we think that getting new countertops should be an easy and smooth procedure. We have streamlined our system to ensure that needs are fulfilled in the shortest amount of time possible, with the least possible inconvenience to the client. In most cases, if the stone you choose is in-stock, you could have your countertops installed in as little as 1 week from the time of deposit! Bring in a sketch of your kitchen, house plan, or cabinet layout. If you need someone to come and measure for an estimate, we can do that free of charge as well. Once quote is approved and granite is chosen, we require a 50% deposit. At this point we will order the slabs, if not in stock already. We can now give you a template date, and an install date. See below for details on how to do your part to keep those deadlines. We will now schedule a template to be done. It is difficult to give an exact time for the template (though we will try to accommodate your needs as best we can) because each template before yours will take a different amount of time. For time conscious clients, we suggest the first appointment of the day, as that time is easy to pinpoint. For remodels, please have everything removed from on top of the existing counters. The template should take about 1-3 hours depending on the size. It is at this point that any special requests be made to the templator as to how you want the new countertops shaped and so forth. He will inform you of approximate placement number of seams, and answer any questions you may have. By the time the template is done, we need to have all sinks and faucets, or anything you need drilled into the countertop at our office. If we don't, this will hold up the timeline. We are usually ready to cut the countertops within a day of the template. We go to great lengths to ensure that our clients are informed, and have as much input as they want to have into the design of their new tops. After all, you are the one that has to see those tops everyday... you should love them! When the template is done, if you wish to come and see the templates on the slabs before they are cut, we urge you to. This way, your input can be visually seen and we can try to accommodate your requests, based on how the templates fit on the stone. This can take 10 minutes to 1 hour, depending on the variation in the stone. From the time your slabs go on the saw, it takes from 2-4 days to get them ready for install. The slabs are cut, the edgework is done, and then the sinks are cut. We apply sealer to the tops before they leave our shop. Typically, we divide installs into morning, and afternoon. We prefer to do remodels in the morning, as they may take a little longer-but they average between 4 and 6 hours. Afternoon installs are not guaranteed an exact time, as it will depend on when the installers finish their first install. We strongly suggest you schedule your plumber for the following day, to allow for the tops and sinks to set, and all glue to dry. Installers will drill all holes at your home, and may need to make a few other minor cuts inside the house. Cooktops are also cut in place. Our installers are very conscientious and will keep the dust to a minimum. They will clean everything again once the install is completed. All debris will be taken when they leave. Payment is due to the installers when they are finished. If paying by credit card, you may call the number into the office.